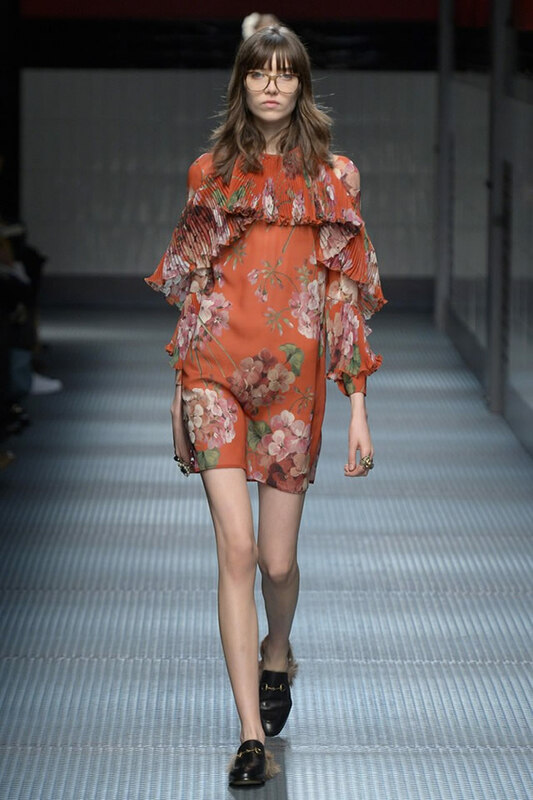 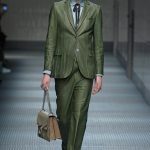 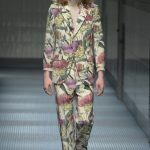 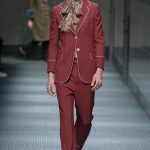 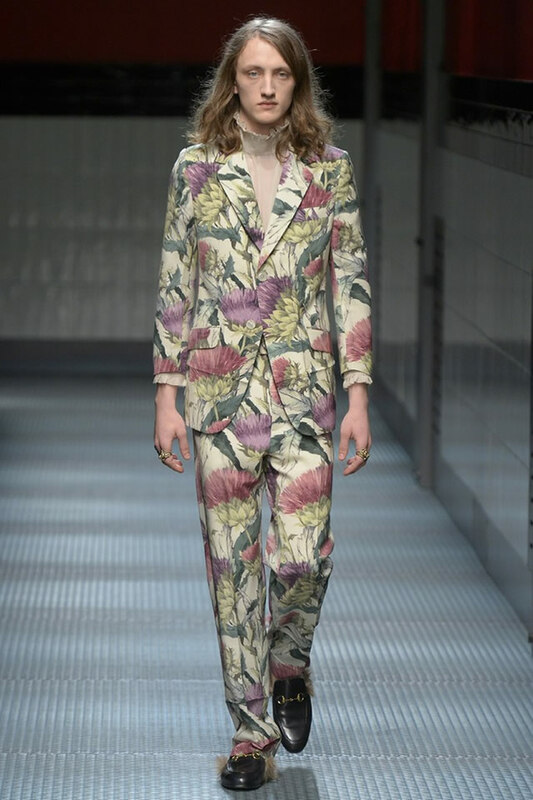 Gucci’s new creative director Alessandro Michele proved himself a risk-taker right out of the starting blocks, with an unapologetically androgynous men’s show last month and, on Wednesday, a women’s collection that moved the brand from the chic resorts of Capri to any stop east of Third Avenue on the L train. 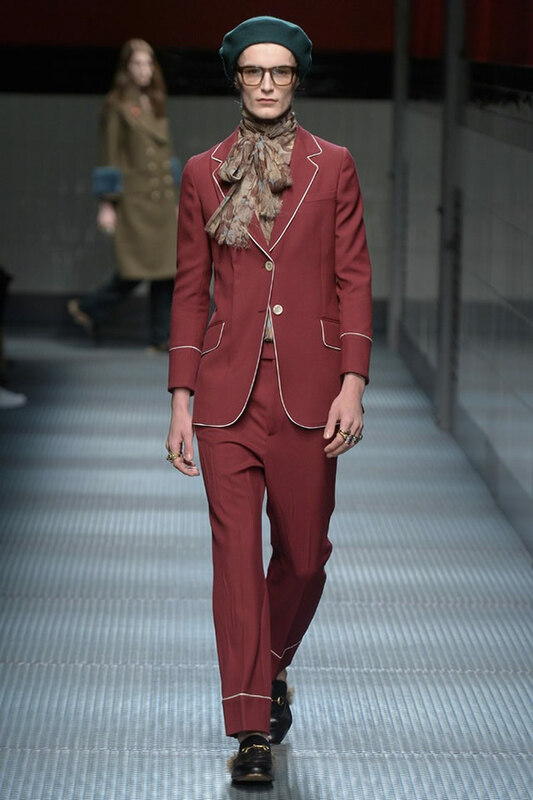 His is a quirkier, younger, more freewheeling Gucci — a bit bohemian like he is, with his scruffy good looks and penchant for patchouli. 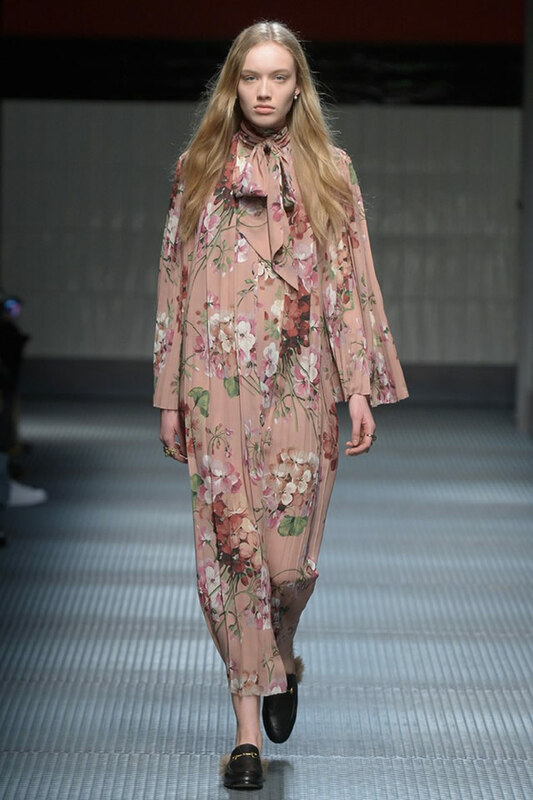 Models strolled the perimeter of a subway set in clothes with a vintage allure — including gauzy, flower-child dresses, schoolteacher skirts and vaguely Seventies pantsuits — but not sprung from the Florentine firm’s vault. 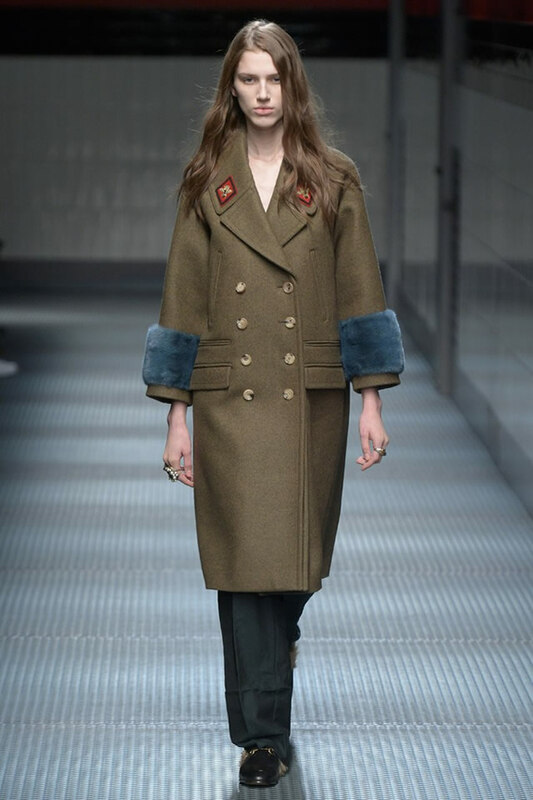 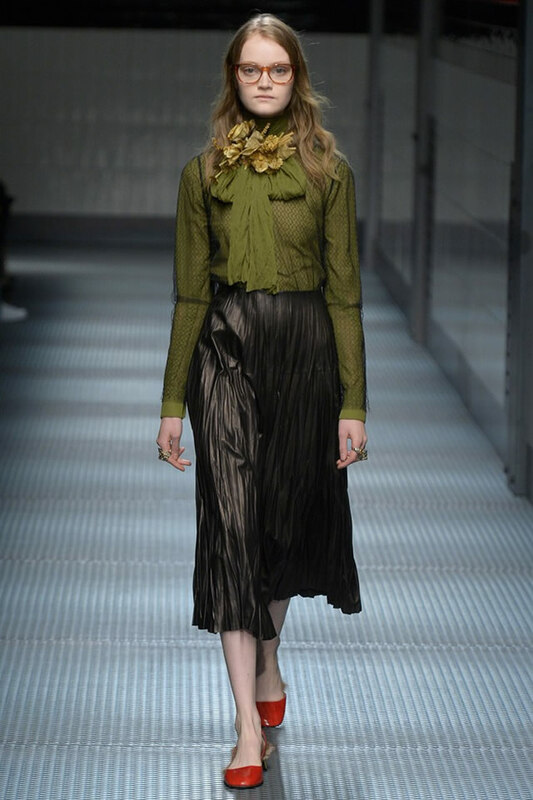 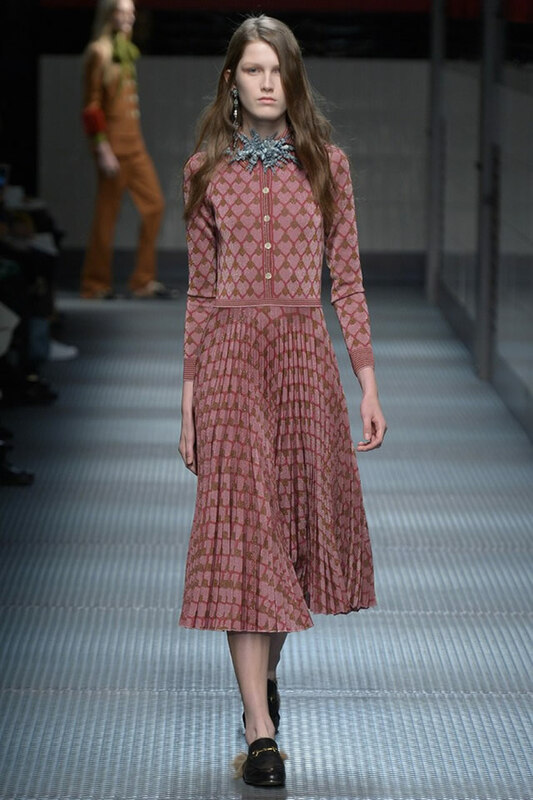 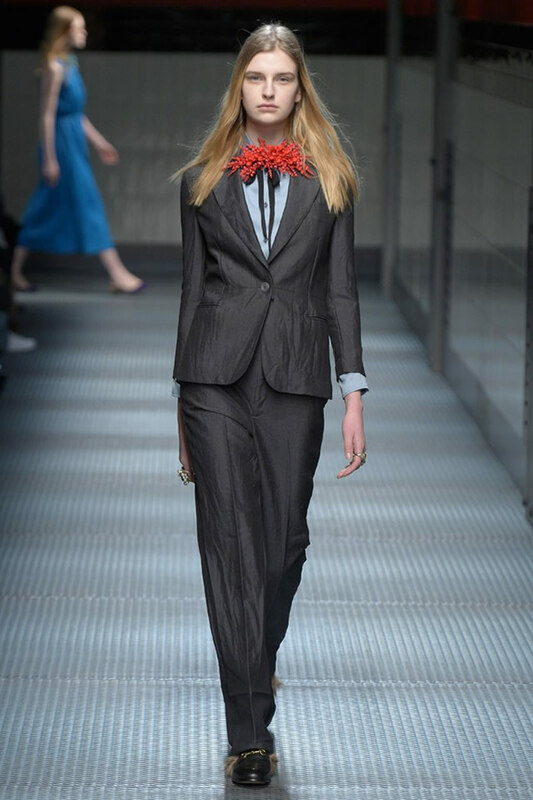 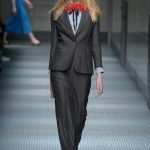 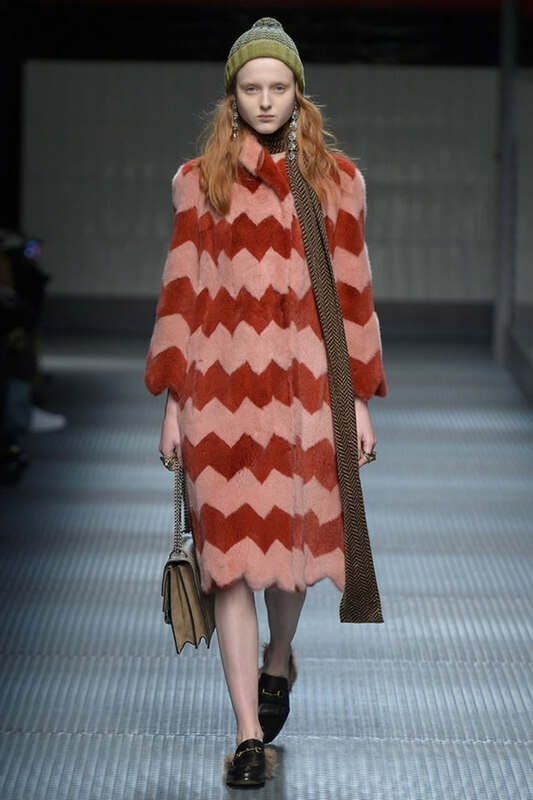 The collection’s inscrutable theme, “The Contemporary is Untimely,” matched its hard-to-put-your-finger-on-it character. 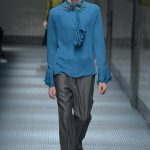 Certainly the nerdy, DIY styling and melancholic mood — heightened by stirring strings from “The Hours” soundtrack — marked a sea change from the high-gloss babes that used to charge out under roving spotlights. 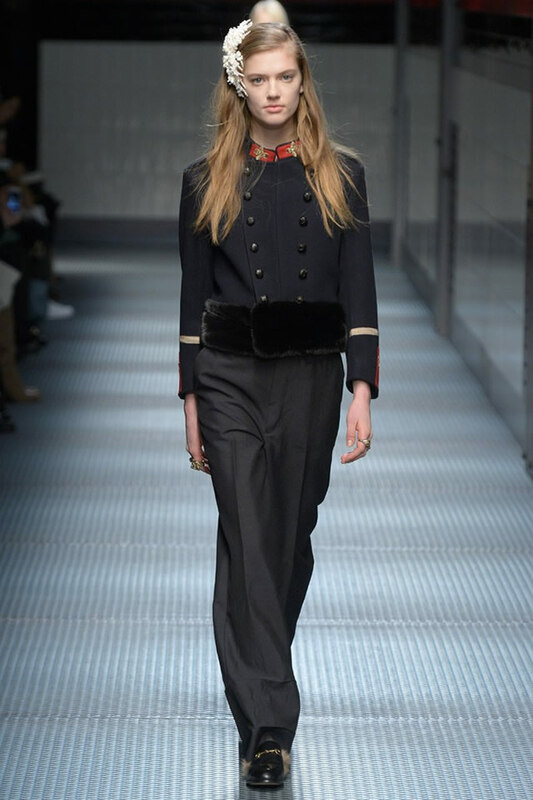 Here was another strong message of regime change, much like the one Nicolas Ghesquière dispatched last year when he arrived at Louis Vuitton, another luxury behemoth to switch designers in the face of a slowing luxury sector — and the limits of megabrand expansion. 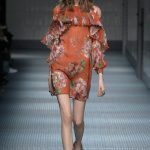 Yet Michele is an untested ready-to-wear talent, not a marquee name, inheriting the creative mantle of one of Italy’s most emblematic fashion companies. 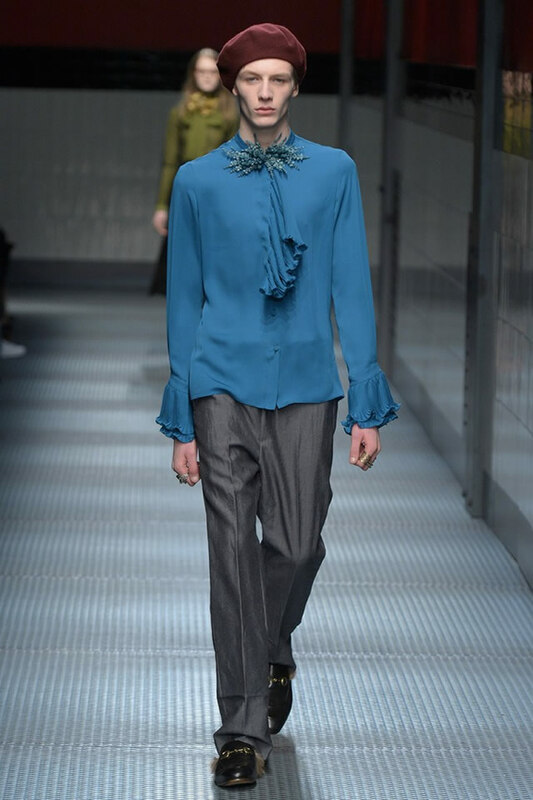 Less than two months into the job — he was previously head accessories designer and deputy of Frida Giannini — the young Italian took an eccentric, democratic approach rather than making a big, unmissable fashion statement. 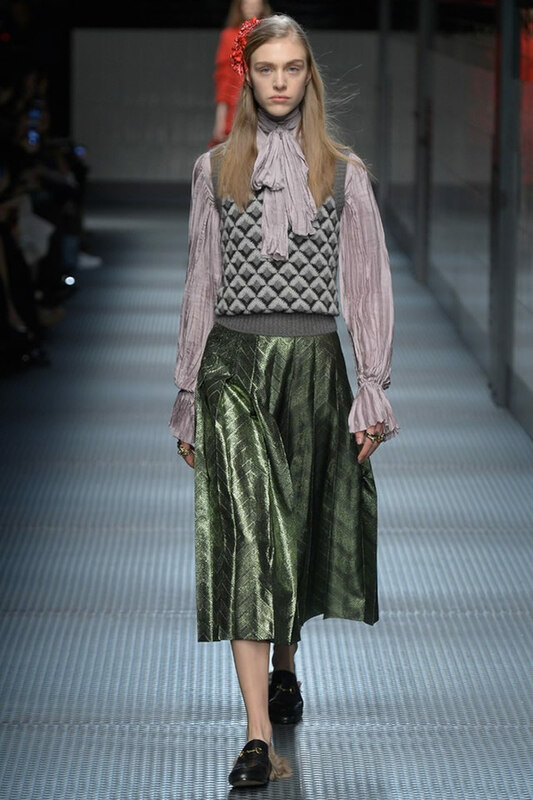 He showed a commitment to accordion-pleat skirts, including gorgeous ones in nappa leather and optical-print Lurex; tailoring that skewed mannish or pajamalike; and demure, feminine dresses in tapestry prints or with coiling ruffles. 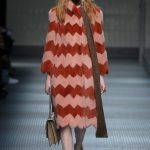 Perhaps the biggest takeaway was Michele’s offbeat way with luxury: ringing the cuffs of Army surplus coats in vivid mink; leaving the wrinkles in cool, low-slung trousers that both sexes can wear; or applying dense bird embroideries to a humble gray sweater vest, or the back of a granny mink. 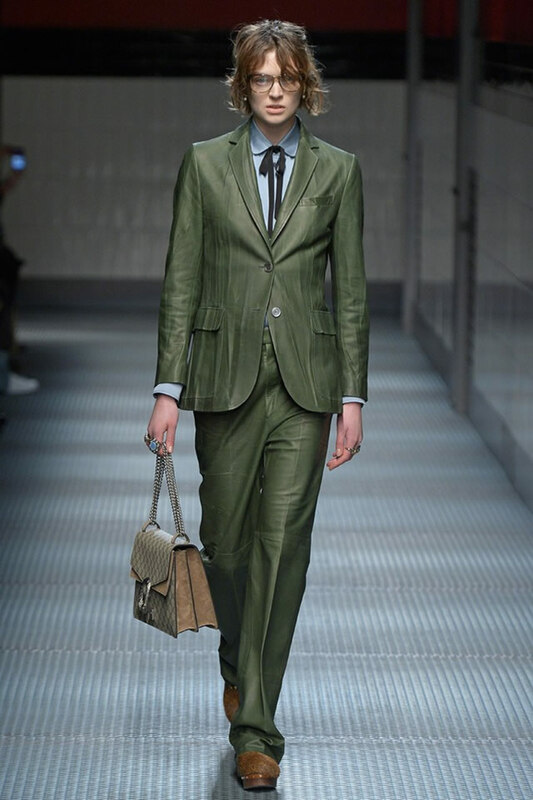 He certainly unleashed an array of quirky, eye-catching accessories. 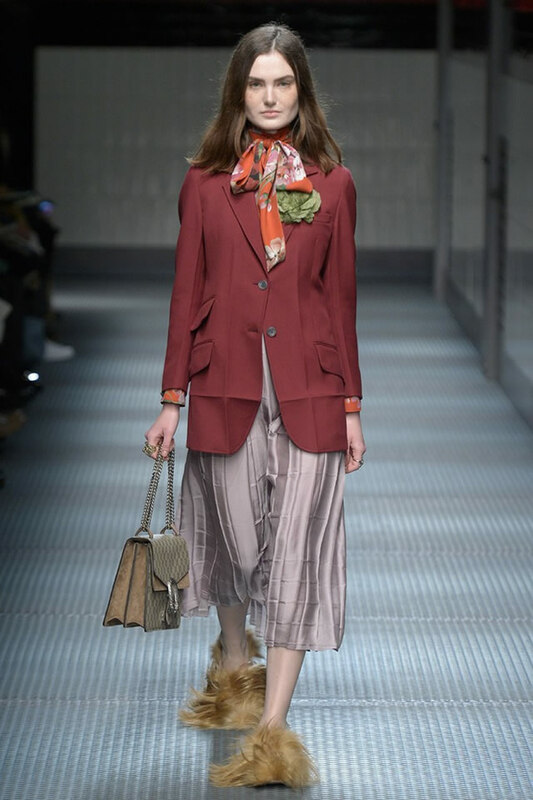 Horse-bit loafers morphed into fur-lined slippers and clogs, and logo bags come hand-painted with flowers or embroidered with big insects. 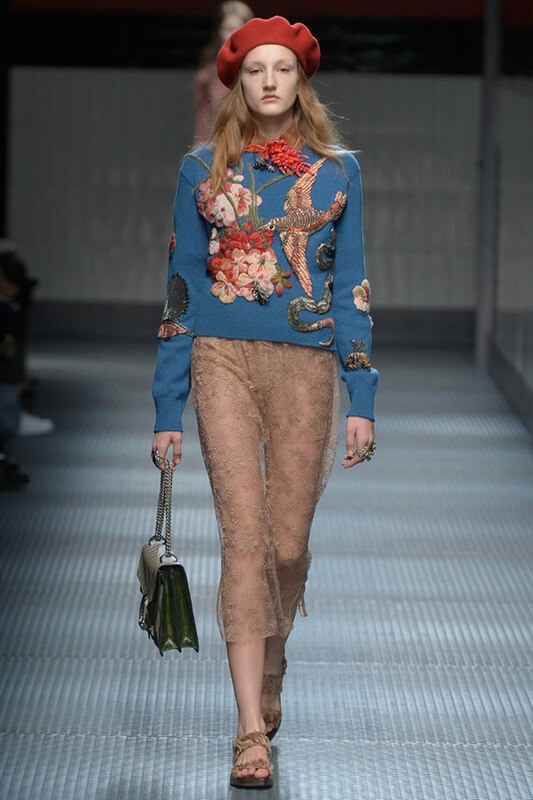 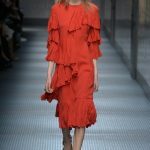 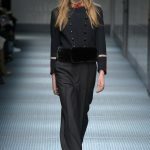 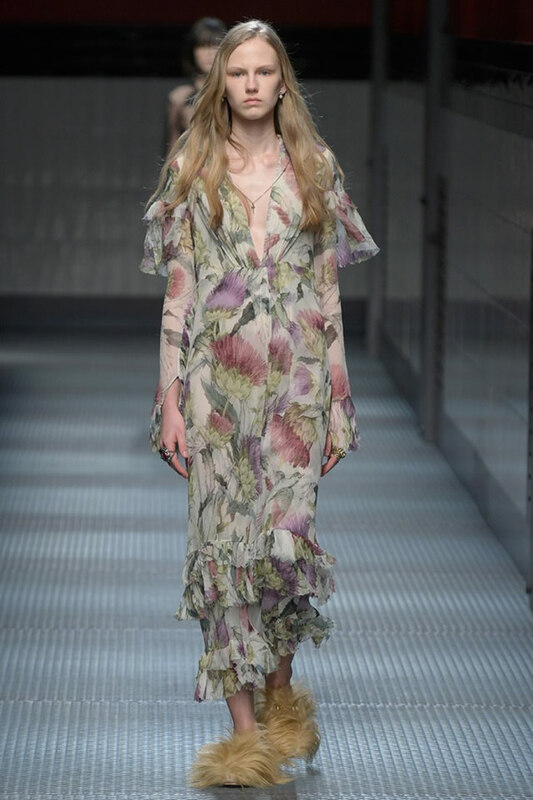 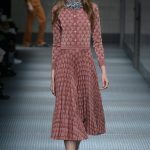 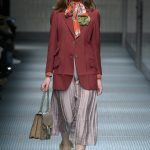 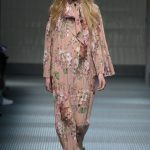 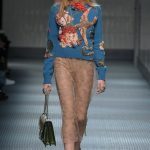 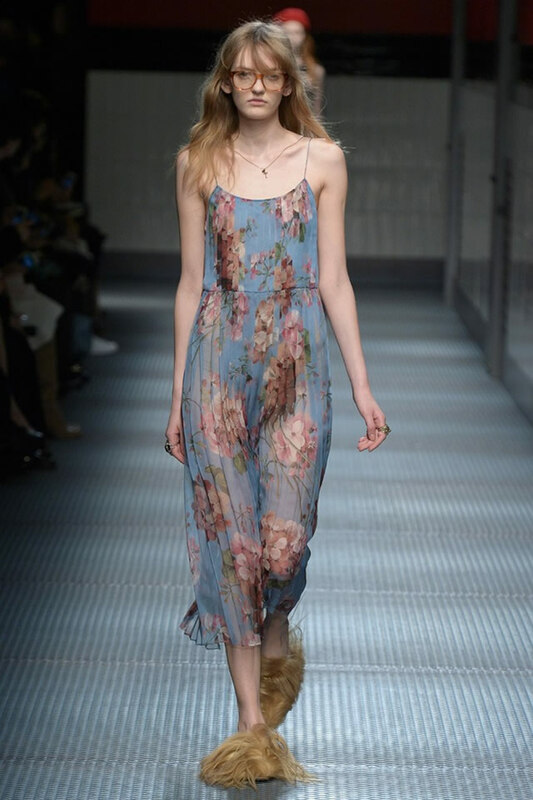 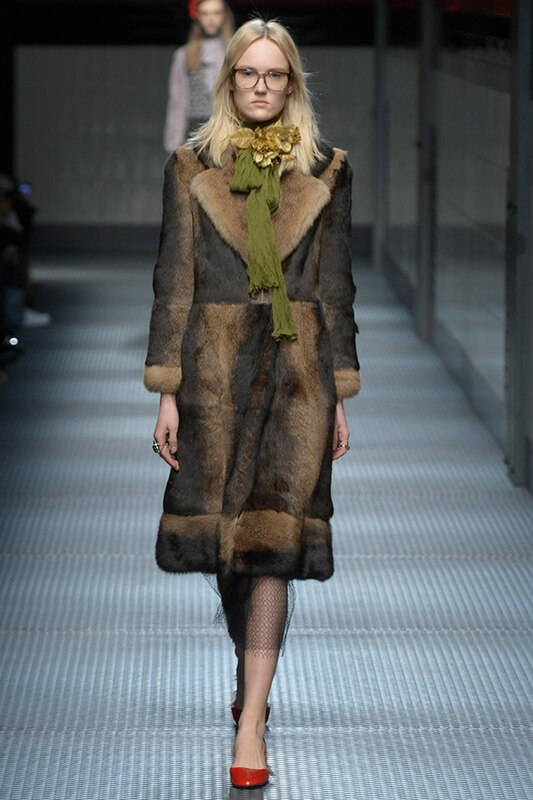 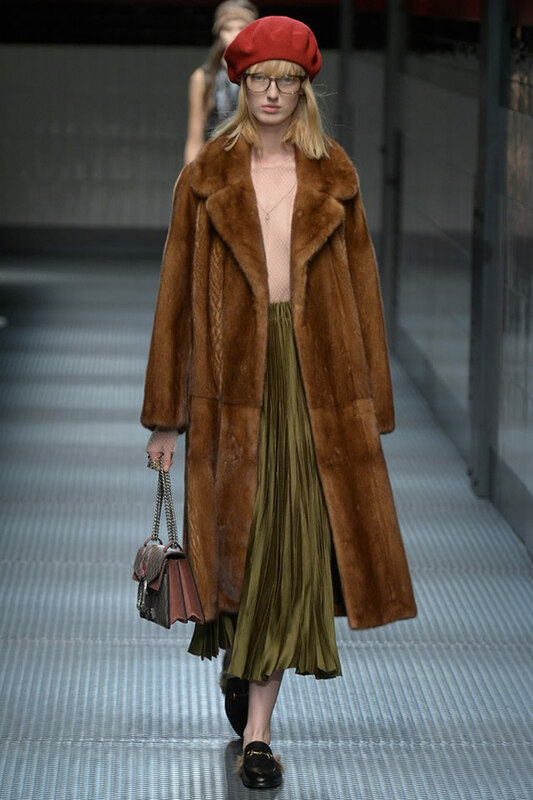 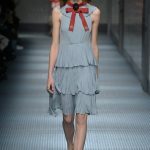 “I tried to give to the brand some romanticism,” Michele said backstage after briefing Gucci chief executive officer Marco Bizzarri, who has characterized the designer as “exactly the right person” to help the house stem its flagging fortunes and reclaim its status as an innovator rather than just another purveyor of luxury goods.